TS EAMCET Revised Rules 2018 for BSc Forestry course admissions: TS EAMCET Revised Rules 2018 for Engineering, BSc Agriculture, Medical, Veterinary, BSc Forestry courses admissions. Students who want to study the BSc Forestry course will have to get admission through EAMCET. The minimum age for students who want to study the BSc Forestry course is 17 years as on 31st December, the maximum age is 22 years for General, BC Candidates and 25 years for SC / ST candidates. 3.From the Secretary, TSCHE Lr.No.TSCHE/CETs/Nov-2017, dt.29.11.2017. 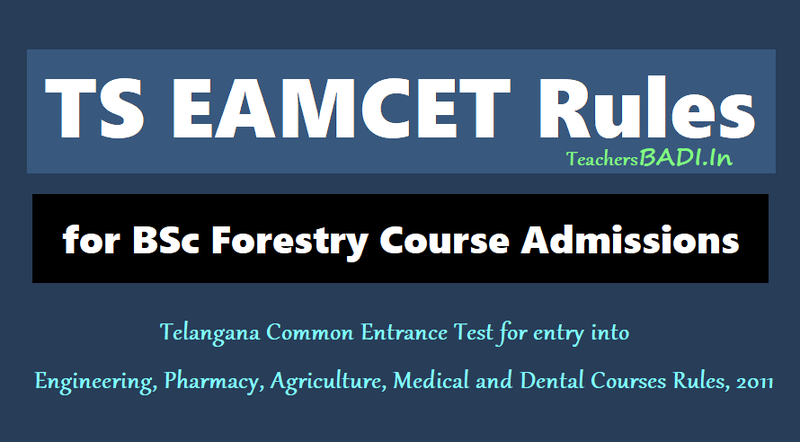 In exercise of the powers conferred by sections 3 and 15 of the Telangana Educational Institutions (Regulation of Admission and Prohibition of Capitation Fee) Act, 1983, the Governor of Telangana hereby makes the following Amendments to the Telangana Common Entrance Test for entry into Engineering, Pharmacy, Agriculture, Medical and Dental Courses Rules, 2011 (EAMCET/EAMCET-AC) issued in G.O.Ms.No.73, Higher Education(EC.2)Dept., dt.28-07-2011 as amended from time to time. 1. In sub-rule(2) of rule (1), after the words "Agriculture (including Veterinary)" the word 'Forestry' shall be inserted. (ii) The candidate should have completed 17 years of age as on 31st December of the year of admission and the upper age limit is 22 years for General and BC candidates and 25 years in respect of Scheduled Caste and Scheduled Tribe candidates as on 31st December of the year of Admissions. (iii) Candidates should obtain at least 45% of marks (40% in case of candidates belonging to SC/ST category) in the subjects specified taken together at 10+2 / Intermediate. NOTE: Proof of satisfying the marks criteria in the qualifying examination in respect of candidates who appeared for the examination during the year of admission should be furnished at the time of admissions.